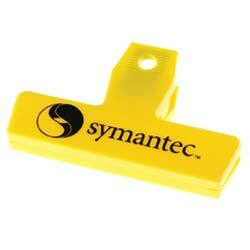 High quality, yet inexpensive promotional Bag Clips in bulk, custom imprinted. We also supply blank (not personalized) bulk Bag Clips for $0.59 each. Free artwork design! American clients pay no taxes. The unit prices below include your 1-color custom imprint on one side. Add the amount shown for each additional imprint color. We also supply blank (not custom imprinted) bulk Bag Clip for $0.59 each. Canadian Clients: Please multiply all US prices by 1.30 to find CAD$ prices. PRODUCTION TIME: 3-5 days after art approval; Blank items ship next day.